Hi everyone, today I'm here with another card tutorial for you all. 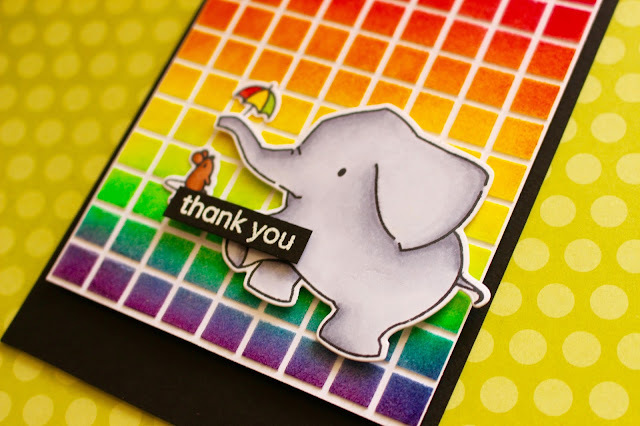 Today's card features some Mama Elephant and Clearly Besotted stamps along with the Ranger Texture Paste, Distress Inks and Copic Markers. I first started off with the Ranger Texture Paste and an Simon Says Stamp stencil - I love this grid stencil, so simple and because of it being quite intricate, you can get a lot of colour in it. I used my palette knife to scoop some texture paste out and I applied it over my stencil. I then set it to dry one I got the layer nice and smooth. I then moved onto my colouring. It was some super simple colouring today. I used my copic markers along with the Ella and Friends set by Mama Elephant. I coloured the elephant, mouse & umbrella. I then die cut those out with the coordinating dies. Once they were done I prepped the card base and sentiment, I just used a simple Thank You sentiment from a Clearly Besotted set and white heat embossed it on some black cardstock, by Simon Says Stamp and I then used that same cardstock to cover my card base. Once that was completed my textured pasted piece had dried. So I grabbed out some distress ink in rainbows colours. I then placed the stencil back over my texture pasted piece and adhered it back down over top. I then ink blended in all the colours of ink over top to create a rainbow. The texture paste does this well and doesn't peel up! Along as it's dry of course. Once it had all been coloured, it was time to assemble the card. I added some fun foam to the back on the texture pasted piece and then adhered that piece onto the card. 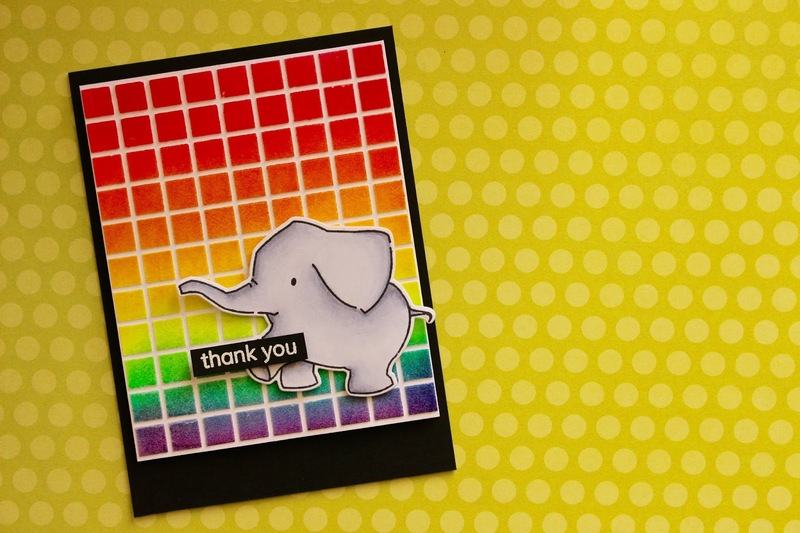 I then grabbed my elephant and sentiment and adhered those onto the card with some 3M foam adhesive. At that stage I didn't like the way the umbrella & mouse looked on the card so I left those off. But, you'll see on this picture that I decided to add those on after all! Thanks for stopping by today and I'll see you again soon! Love the background! Can I know what heat tool are you using please? Hi, Eloise. I just stumbled across your older blog post mentioning that it's Zap by American Crafts. Just wondering if it requires an universal plug to function? I'm based in NZ and am considering getting one myself.